The internment of Japanese Americans was the forced removal and confinement of approximately 120,000  Japanese Americans (62% of whom were United States citizens)   from the West Coast of the United States during World War II. Some 5,500 Japanese American men arrested by the FBI immediately after the attack on Pearl Harbor were sent directly to internment camps run by the Department of Justice,  and approximately 5,000 were able to "voluntarily" relocate to other parts of the country before forced evacuations began. The remainder — roughly 110,000 men, women and children — were sent to "relocation centers," hastily constructed camps in remote portions of the nation's interior, run by the War Relocation Authority (WRA). Japanese Americans are Americans who are fully or partially of Japanese descent, especially those who identify with that ancestry, along with their cultural characteristics. Japanese Americans were among the three largest Asian American ethnic communities during the 20th century; but, according to the 2000 census, they have declined in number to constitute the sixth largest Asian American group at around 1.4 million, including those of partial ancestry. According to the 2010 census, the largest Japanese American communities were found in California with 272,528, Hawaii with 185,502, New York with 37,780, Washington with 35,008, Illinois with 17,542, and Ohio with 16,995. Southern California has the largest Japanese American population in North America and the city of Torrance holds the densest Japanese American population in the 48 contiguous states. Executive Order 9066 was a United States presidential executive order signed and issued during World War II by United States President Franklin D. Roosevelt on February 19, 1942. 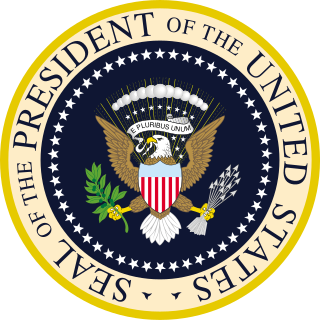 This order authorized the Secretary of War to prescribe certain areas as military zones, clearing the way for the incarceration of Japanese Americans, German Americans, and Italian Americans in U.S. concentration camps. The Japanese American Citizens League is an Asian American civil rights charity, headquartered in San Francisco, with regional offices across the United States. Daniel Ken Inouye was an American politician who served as a United States Senator from Hawaii from 1963 until his death in 2012. A member of the Democratic Party, he was President pro tempore of the United States Senate from 2010 until his death, making him the highest-ranking Asian-American politician in US history. 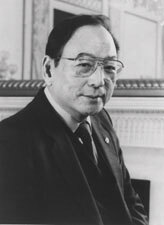 Inouye also chaired various Senate Committees, including those on Intelligence, Commerce and Appropriations. Spark Masayuki Matsunaga was a United States Senator from Hawaii, serving from 1977 until his death in 1990. He was an American Democrat whose legislation in the United States Senate led to the creation of the Commission on Wartime Relocation and Internment of Civilians and the United States Institute of Peace. ↑ 100th Congress, S. 1009, reproduced at internmentarchives.com; accessed September 19, 2006. 1 2 3 Sharon Yamato. "Civil Liberties Act of 1988," Densho Encyclopedia (accessed July 16, 2014). ↑ "Campaign for Justice". Nikkei for Civil Rights and Redress. Retrieved March 12, 2007. ↑ Various primary and secondary sources list counts between 110,000 and 120,000 persons. ↑ Semiannual Report of the War Relocation Authority, for the period January 1 to June 30, 1946, not dated. Papers of Dillon S. Myer. Scanned image at trumanlibrary.org. Accessed September 18, 2006. ↑ Densho. "About the Incarceration" (accessed April 3, 2014). ↑ Brian Niiya. "Voluntary evacuation," Densho Encyclopedia (accessed April 3, 2014). ↑ Sharon Yamato. "Civil Liberties Public Education Fund," Densho Encyclopedia (accessed July 17, 2014). ↑ "Chapter 52—Restitution For World War II Internment of Japanese-Americans and Aleuts" . Retrieved August 8, 2018. The Heart Mountain War Relocation Center, named after nearby Heart Mountain and located midway between the towns of Cody and Powell in northwest Wyoming, was one of ten concentration camps used for the internment of Japanese Americans evicted from the West Coast Exclusion Zone during World War II by executive order from President Franklin Roosevelt after the bombing of Pearl Harbor in December 1941, upon the recommendation of Lieutenant General John L. DeWitt. The Tule Lake National Monument in Modoc and Siskiyou counties in California, consists primarily of the site of the Tule Lake War Relocation Center, one of ten concentration camps constructed in 1942 by the United States government to incarcerate Japanese Americans forcibly removed from their homes on the West Coast. They totaled nearly 120,000 people, two-thirds of whom were United States citizens. Minidoka National Historic Site is a National Historic Site in the western United States. It commemorates the more than 9,000 Japanese Americans who were imprisoned at the Minidoka War Relocation Center during the Second World War. The Aleut Restitution Act of 1988 was a reparation settlement passed by the United States Congress in 1988, in response to the internment of Aleut people living in the Aleutian Islands during World War II. The Topaz War Relocation Center, also known as the Central Utah Relocation Center (Topaz) and briefly as the Abraham Relocation Center, was an internment camp which housed Americans of Japanese descent and immigrants who had come to the United States from Japan, called Nikkei. President Franklin Roosevelt signed Executive Order 9066 in February 1942, ordering people of Japanese ancestry to be incarcerated in "relocation centers" like Topaz during World War II. Most of the people interred at Topaz came from the Tanforan Assembly Center and previously lived in the San Francisco Bay Area. The camp was opened in September 1942 and closed in October 1945. The Commission on Wartime Relocation and Internment of Civilians (CWRIC) was a group of nine people appointed by the U.S. Congress in 1980 to conduct an official governmental study of Executive Order 9066 (1942), related orders during World War II, and their effects on Japanese Americans in the West and Alaska Natives in the Pribilof Islands. In February 1981, the Commission concluded that the incarceration of Japanese Americans during World War II was a "grave injustice." In July 1981, the Commission held public hearings in Washington, D.C. to hear testimony from Japanese-American and Alaska Native witnesses. Public hearings followed in other American cities, including Seattle, San Francisco, Cambridge, New York City, Anchorage, the Aleutian Islands, Pribilof Islands, Chicago, and Los Angeles, where the testimonies were recorded. More than 750 people testified. On February 19, 1942, President Franklin D. Roosevelt signed Executive Order 9066 relocating 110,000 Japanese Americans from the West Coast into internment camps for the duration of the war. The personal rights, liberties, and freedoms of Japanese Americans were suspended by the United States Government. The following article focuses on the movement to obtain redress for the internment of Japanese Americans during World War II, and significant court cases that have shaped civil and human rights for Japanese Americans and other minorities. These cases have been the cause and/or catalyst to many changes in United States law. But mainly, they have resulted in adjusting the perception of Asian immigrants in the eyes of the American government. Japanese American history is the history of Japanese Americans or the history of ethnic Japanese in the United States. People from Japan began immigrating to the U.S. in significant numbers following the political, cultural, and social changes stemming from the 1868 Meiji Restoration. Japanese immigration to the Americas started with immigration to Hawaii and Alaska in the first year of the Meiji period in 1868. Densho is a nonprofit organization based in Seattle, Washington, which collects video oral histories and documents regarding Japanese American internment in the United States during World War II. Densho offers a free online digital archive of the primary sources for educational purposes. Tsuyako "Sox" Kitashima was a Japanese-American activist noted for her role in seeking reparations for Japanese American internment by the United States government during World War II, particularly as investigated by the Commission on Wartime Relocation and Internment of Civilians in the 1980s. William Minoru Hohri was an American political activist and the lead plaintiff in the National Council for Japanese American Redress lawsuit seeking monetary reparations for the internment of Japanese Americans during World War II. He was sent to the Manzanar concentration camp with his family after the attack on Pearl Harbor triggered the United States' entry into the war. After leading the NCJAR's class action suit against the federal government, which was dismissed, Hohri's advocacy helped convince Congress to pass legislation that provided compensation to each surviving internee. The legislation, signed by President Ronald Reagan in 1988, included an apology to those sent to the camps. Michi Nishiura Weglyn was the author of the book Years of Infamy: The Untold Story of America’s Concentration Camps, which fueled a movement leading to reparations for Japanese Americans interned during World War II. She was also a vocal advocate for those denied redress under the Civil Liberties Act of 1988 and for the more than 2,200 Japanese Peruvians who were taken from their homes by the U.S. government and used in a hostage exchange program with Japan. Aiko Herzig-Yoshinaga was an American political activist who played a major role in the Japanese American redress movement. She was the lead researcher of the Commission on Wartime Relocation and Internment of Civilians, a bipartisan federal committee appointed by Congress in 1980 to review the causes and effects of the Japanese American incarceration during World War II. Herzig-Yoshinaga, who was confined in the Manzanar, California and Jerome and Rohwer, Arkansas concentration camps as a young woman, uncovered government documents that debunked the wartime administration's claims of "military necessity" and helped compile the CWRIC's final report, Personal Justice Denied, which led to the issuance of a formal apology and reparations for former camp inmates. She also contributed pivotal evidence and testimony to the Hirabayashi, Korematsu and Yasui coram nobis cases. Lillian Baker was a conservative author and lecturer She is known for supporting Japanese-American Internment throughout her career. 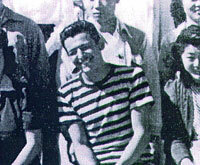 Ralph Lazo was the only known non-spouse, non-Japanese American who voluntarily relocated to a World War II Japanese American internment camp. His experience was the subject of the 2004 narrative short film Stand Up for Justice: The Ralph Lazo Story. Grayce Uyehara, née Kaneda, was a Japanese-American social worker and activist who led the campaign for a formal government apology for Japanese-American internment during World War II.